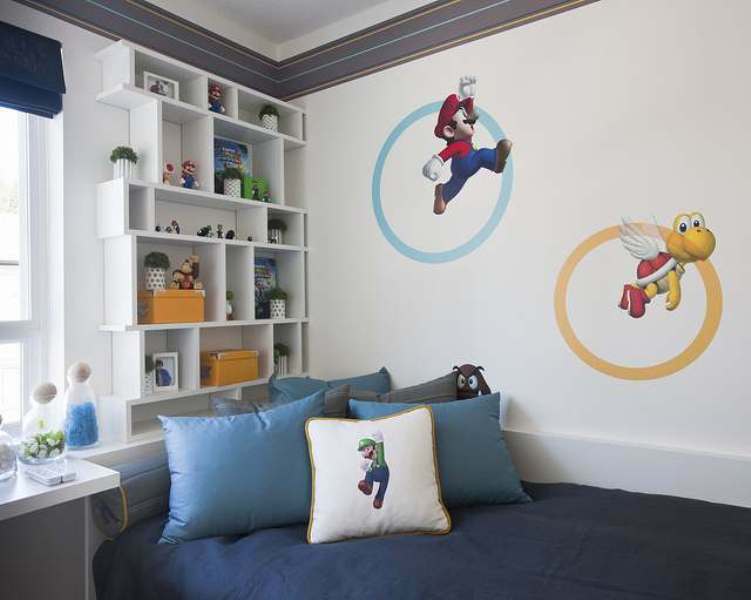 This otherwise simple room takes advantage of a wall decoration picturing a classic game to function as a unique form of video game room decor. The rest of this oddly-shaped interior space is cleverly decorated in contrasting whimsical colors to emphasize that it is being used for play and entertainment. Funky throw pillows with bold printed statements add another splash of personality, while the constellation of overhead lighting fixtures add an adjustable amount of ambient background illumination. Colorful drapes maintain the overall theme while blocking out natural light during game play, helping to focus the eye on the action unfolding on the screen. With just a bit of effort, this room has been transformed into an intimate space proudly proclaiming a love for classic video games. A theme throw pillow, in combination with matching statuettes strategically placed on the shelving, help add emphasis to the colorful wall decoration. Large video game stickers have been given additional visual texture with the use of large circles, adding a playful element of action and energy to the room. 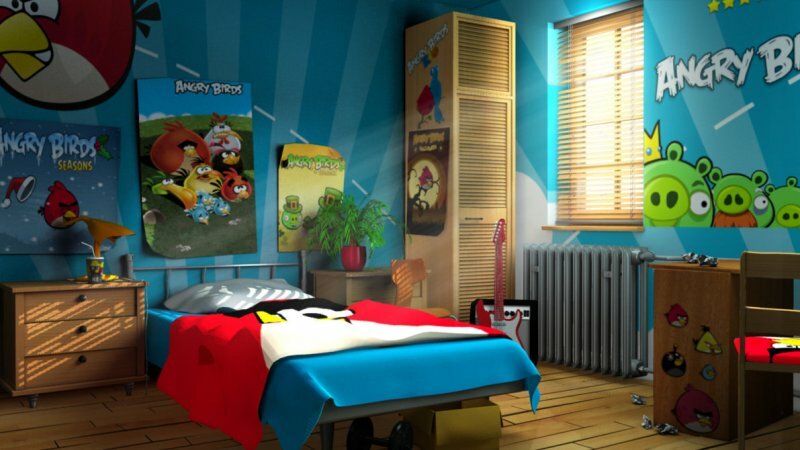 A prized plush figure from the game series adds an additional splash of whimsy to this exuberant room. For the truly passionate players of games, it is possible to combine various media to transform a space into a gaming sanctuary. Bed linen adds a unique horizontal texture to the strong vertical elements of wall paintings and framed prints. Stickers and decals on the desk and freestanding closet add further testimony to this room’s playful function. By adding matching background colors to the walls, the overall theme of the room is further tied together while the clouds and sky elements make this otherwise small space feel larger and more airy. 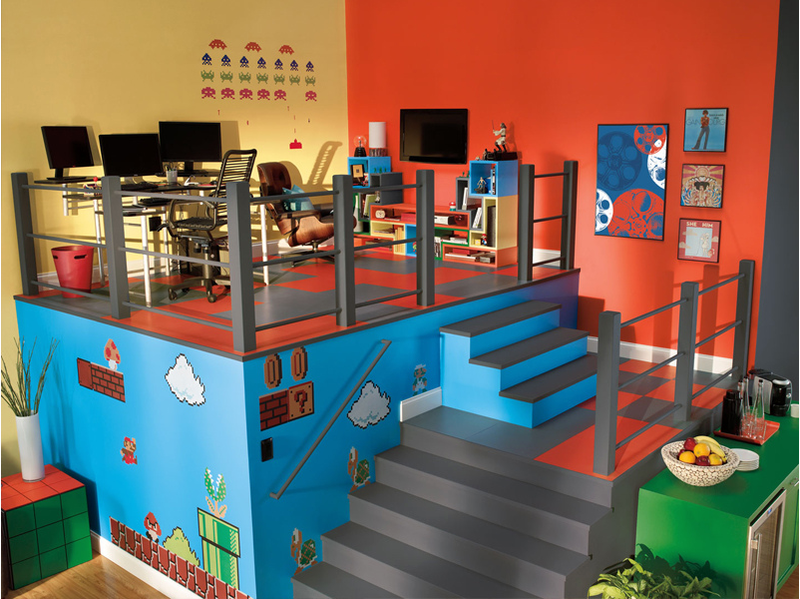 This room makes clever use of a unique multi-level room layout to add video game themes to otherwise unused vertical spaces. The full-sized wall spaces have been further transformed to resemble screenshots from classic games, while the subtle use of a partial checkerboard on the landing adds additional emphasis to the gaming room design. Other whimsical accent pieces such as the small night stand painted to resemble a popular game cube, as well as the bold mix of primary colors, making this interior space eligible for the title of the ultimate gaming room. In small spaces, it can be difficult to provide enough proper background illumination to prevent the eye from being overwhelmed by the light coming from the main playing screen. In this room, a large light bar has been installed above the viewing screen, adding energy and brightness to what otherwise would be a very cramped space. The clever use of light colors and pale earth tones adds an additional layer of airiness to this small room, while two dedicated gaming chairs allow for hours of uninterrupted play enjoyment. The speakers have been mounted to frame the main screen, nicely complimenting the light bar above, adding an additional subtle focus on the action unfurling on the screen. 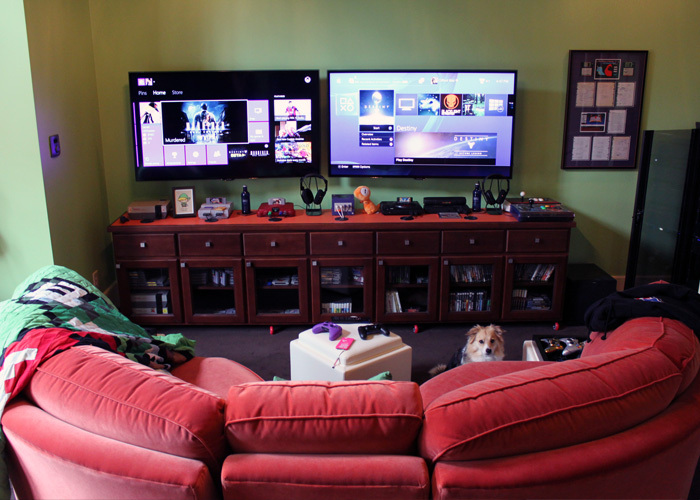 Sometimes, the budget for creating the ultimate gaming room isn’t enough to cover brand new pieces. In this photo, an existing cabinet piece has been adapted to serve as the focal point for the gaming experience. 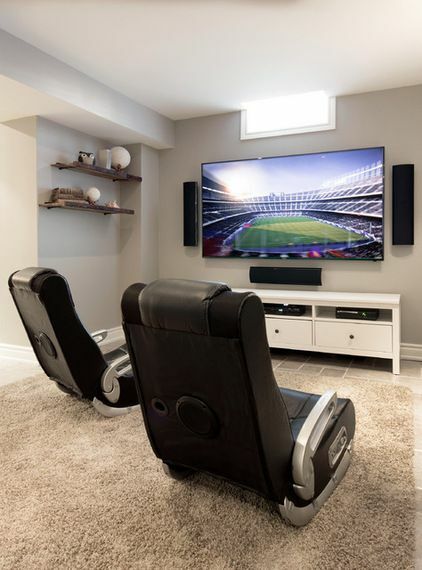 Everything from headphones to gaming-themed merchandise adds a subtle emphasis to the action on the screen, while an existing hemispherical couch and two screens allow the whole family to enjoy an enhanced spectator experience. By taking advantage of an existing recess in the wall, the room is exposed to plenty of natural light without shining directly on the gaming screens. For truly passionate aficionados of games and popular entertainment culture, coming up gaming room setup ideas can be a really fun challenge. 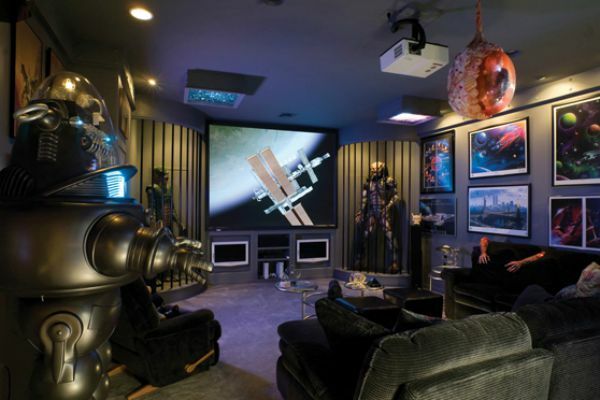 In this room, every available space has been cleverly used with different visual textures, including the multiple use of full-sized statues flanking the screen, the funky ceiling fixture and illuminated robot figure. Ambient lighting has been provided for by the unique use of recessed lighting in the ceiling as well as accent spotlights on the multiple theme prints on the wall. An overhead projector nicely compliments the full three dimensionality of the space, leaving no one in doubt that this space is competing for the title of the ultimate gaming room. Even in small spaces, the right use of video game room furniture can transform an otherwise neutral corner of the house into an immersive arcade experience. 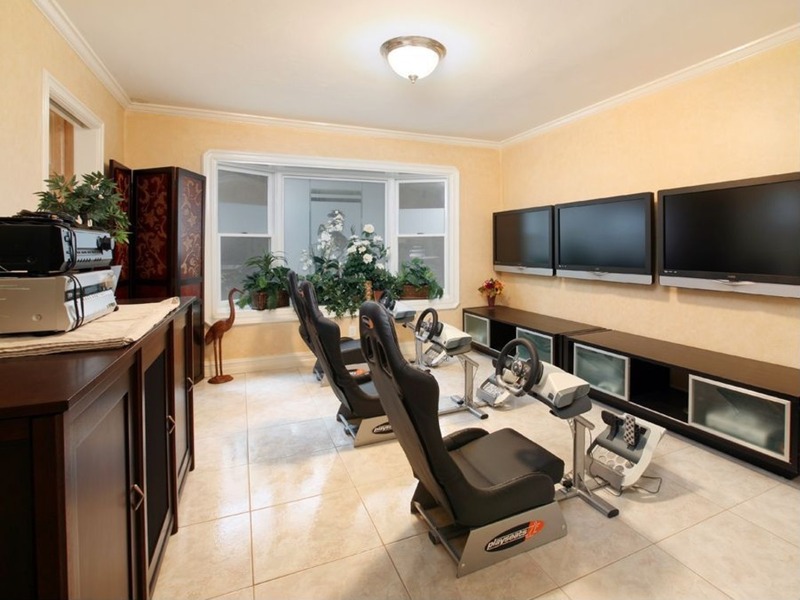 While keeping the decor to a bare minimum, the use of multiple screens and side-by-side driving simulators allow for competitive gaming excitement in this otherwise bland games room. Light pastel colors and flooring design in this brightly illuminated room help draw the eye towards the wall-mounted screens, while a minimalist use of the space allows it to be quickly transformed for non-gaming use. 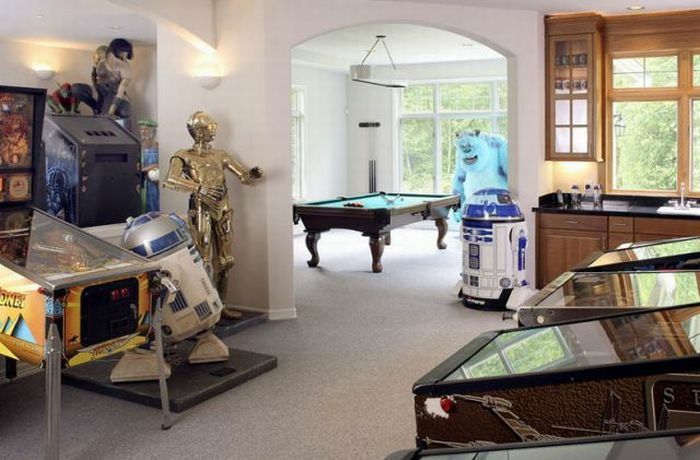 Some of the best game room ideas incorporate many different modalities of play, combining centuries-old classic games with pinball machines and other non-computerized forms of gaming entertainment. The fun use of full-sized figures from popular movies and television add an additional layer of three dimensionality to this space, all tied together neatly with a sink and mini kitchen for entertaining visitors during extended play sessions.